Powerstep is proud to announce the latest addition to their ProTech product line, the ProTech Contol, featuring Powerstep’s exclusive Foot Secure System. Designed specifically for those with mild to moderate pronation, the ProTech Control subtly incorporates a two-degree exterior post to prevent overpronation- you’ll never notice it’s there, but your feet will feel the difference! You’ll also enjoy the comfort and protection of the ProTech Control’s deeper heel cup design. The Powerstep ProTech Control maintains the high standard of quality you’ve come to expect from all our products. 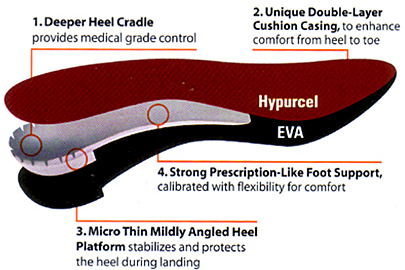 Our attention to detail is evident in the craftsmanship of the ProTech’s Poron heel Comfort Cushion, double strength arch support, double layer EVA cushion casing, and anti-microbial top cover. Plus, our ProTech Classic Plus now features all the comfort and benefits of the ProTech Full Length, but its thinner design fits more easily into a variety of shoe styles so you can protect and comfort your feet no matter what the occasion!